I’ve said it once. I’ve said it twice. 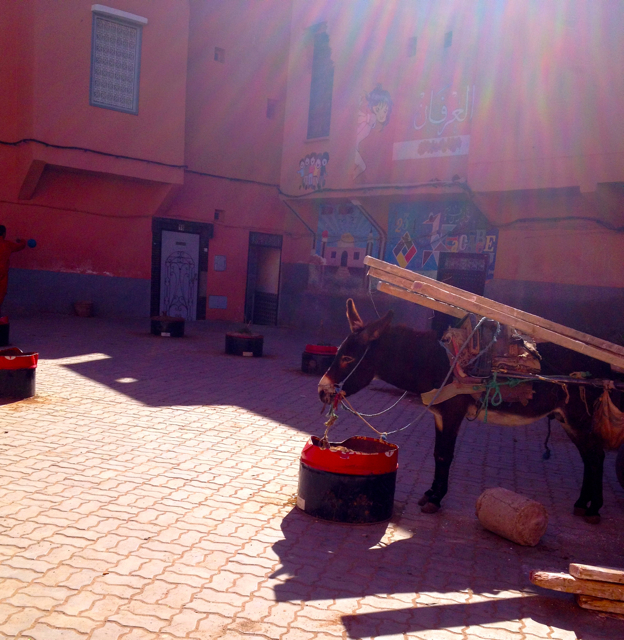 I’ll say it again – I love Marrakech! Before I went on my trip a lot of friends and acquaintances expressed concern for me traveling to this developing nation with just one other female friend. 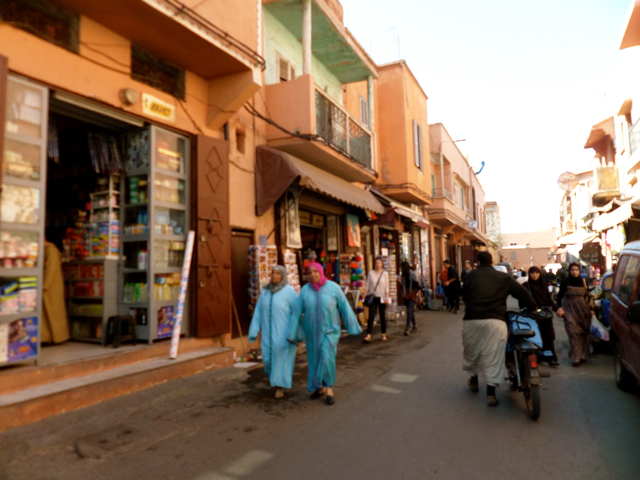 Being this was my first time in Morocco or anywhere in Africa, I was a little wary when I first arrived in the city. However, I quickly discovered that this is indeed a beautiful country with warm people and a fascinating culture. 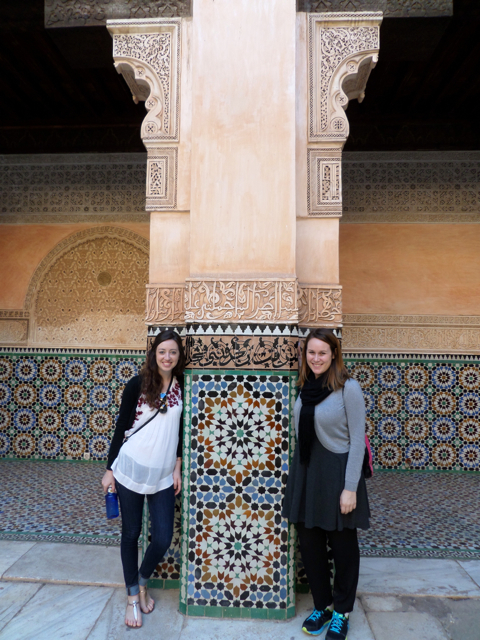 There’s no denying that Marrakech is another world though, and there are some things to keep in mind when travelling that aren’t relevant when traveling in Europe or the United States, especially for female travelers. In the center of a busy crossroads she stood out like a sore thumb: a pale brunette tourist in way too short shorts and a bright yellow halter top, arms and shoulders completely bare under the soft sun. Did anyone say anything to her? No. Did anyone approach her? No. Did anyone threaten her? No. But she got a lot of stares. From the cab drivers, from the women crossing the street with their children, from me. If you were there you would have stared too, only just because she was dressed unlike anyone else in the scene and jarringly contrasted with her surroundings. Truth be told, you could wear whatever you want in Marrakech. There’s no dress code and women aren’t required to wear scarves. But if you do dress like you are going to a beach in the French Riviera you will stick out and attract attention. Respect the culture around you by dressing conservatively in long, loose pants or a skirt and cover your shoulders. At night while walking around I brought a scarf to cover my head. This made me feel way more comfortable and I felt I attracted less attention. 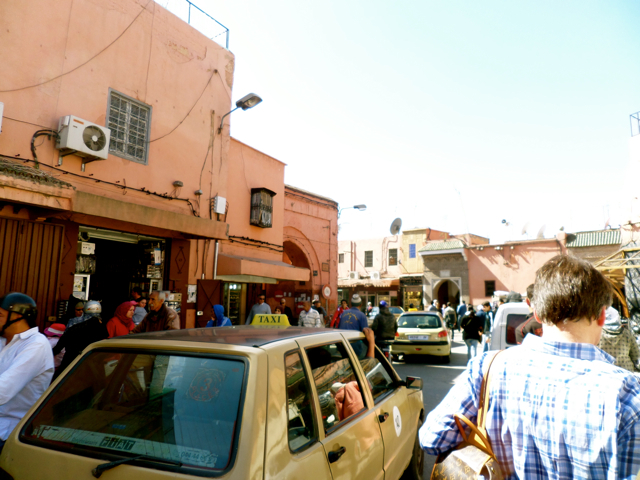 I fell deeply in love with the red walls, winding souks and tangled streets that define Marrakech. 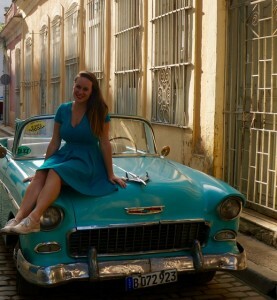 By the end of my stay I was more than comfortable exploring the city with just my friend Emily and even found joy in thrill of haggling prices with cab drivers and warding off unwanted solicitations. During my first moments in the old section of the city, however, I felt anything but comfortable as I walked down a dark, dusty street under the cover of darkness past groups of men dressed much differently than me. This was my first time in Morocco or in Africa, and the city was like anything I’d ever seen before. At first I felt a little unsafe because of how jarring the difference is between Marrakech and Europe or the United States. I think because the country is so different from the Western World, it can take you a while to feel comfortable, especially if you are a female traveling alone or in a small group. Marrakech is actually quite a safe city and the majority of the people are lovely and warm. To ease into the culture and get your bearings, explore with a trusted guide first. My personal recommendation is Mohamed Daif. He can be reached by email at daif996@gmail.com. You’re going to get lost in Marrakech. Unless you have some serious top notch navigational skills or have been there before, plan on it. 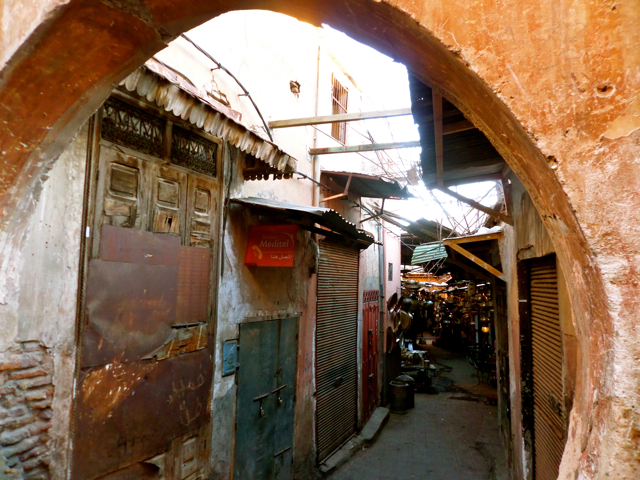 The streets of the medina of Marrakech are a winding maze. There are no street sign and most buildings are unmarked. Luckily, cabs in Marrakech are plentiful in cheap. (Like really cheap). If you aren’t quite sure where to go or get lost, just take a cab to save you stress and time. If you do find yourself lost, try to locate a hotel or café and they can call a trusted cab for you. Cabs also queue in front of the main tourist attractions and transportation hubs. Centrally located accommodation is desirable in most destinations you visit, but in the medina of Marrakech it’s a must. As I said earlier, the medina is maze unlike I’ve seen before, and if you want to have any hope of locating any points of interest you will need to stay in the center. When booking accommodations be wary of Riads or hostel that claim to be centrally located as this is a vague term. Do a Google map search to see if it is indeed centrally located near Jemaa el-Fnaa, the main square. The most centrally located Riad I discovered is Riad Joya, which is a short walk from the main square and highly luxurious. 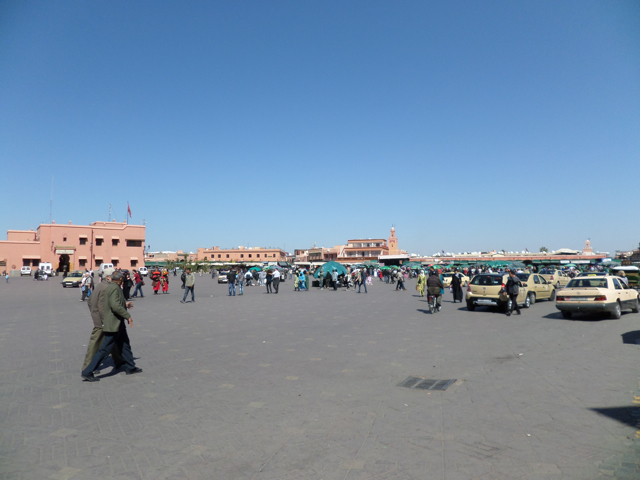 Jemaa el-Fnaa is the main square of Marrakech. With vendors selling fresh orange juice and crafts, snake charmers, live music and belly dancers, it’s an exciting swirl of entertainment. Being the center meeting point for tourists, it’s also the most likely place to be pick pocketed, followed by strangers and taken advantage of for being a tourist. In the center of the main square are four rows of food stalls that claim to have some of the best food in the city. As the sun sets, these narrow rows become packed with people, and a walk through this area will include being jostled around the crowd and followed at an extremely close distance by aggressive salesman trying to get you to stop at their food stall. You may even get grabbed at, groped or otherwise touched in a way you don’t want to. If you don’t want to have this experience, don’t go to this area. Otherwise, be prepared that your time in this section of town will be uncomfortable. 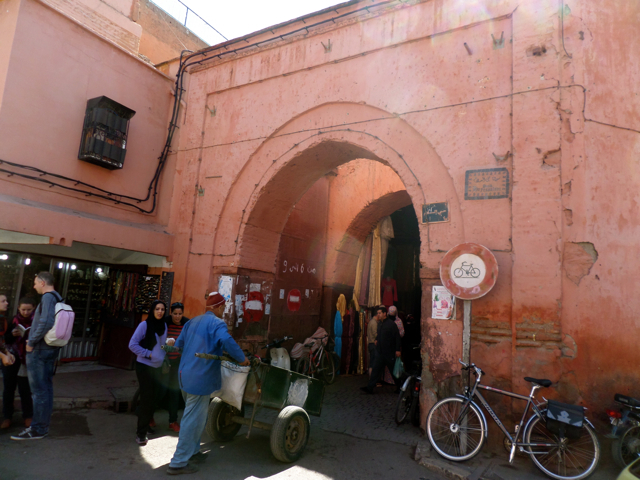 Don’t let your experiences here define your perception of Marrakech or Morocco. It’s a beautiful country with beautiful people, and Jemaa el-Fnaa is such a small part of the city. 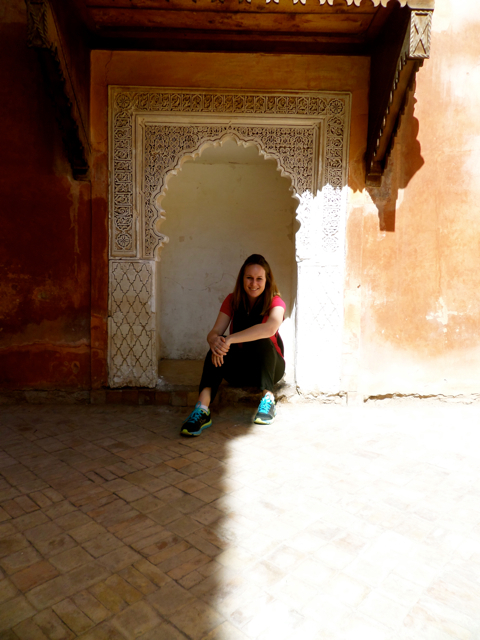 And there you have my top tips for women traveling to Marrakech. For those who have been, what would you add? This is great! I love reading posts like these. They help me to feel far less nervous about visiting somewhere that’s so different to the western world! Hi Maddy! I’m glad my post made you feel less nervous about visiting Morocco. It is a beautiful and moving country and I hope you get to visit some day soon! Nice round up! Happy to read that I am not the only one who felt like this in Marrakech, especially coming from a first timer. Thanks for reading Annika. I’m glad to hear my advice was on par with what you felt in Marrakech. I had a great visit! This is a great read, even after travelling to Marrakech more than once it’s interesting, however I would like to point out that Morocco is certainly not a third world nation!! It’s a developing nation. Joanne, thank you so much for my comment. You are indeed right and I will correct my story. When I wrote this story a year ago Morocco was so different than any place I had ever been that I automatically thought it was a “third world nation.” Now I am living in Central America and I have been learning a lot about the economies of developing nations and how the world is not best viewed in categories, but rather on a sliding scale. Isn’t this the true beauty of travel — to bring light to our ignorances? Thanks again for reading! Hi Lauren, I was just browsing and trying to absorb as much information as I can but really, your blogged post did it for me! I’m planning to travel in April with my sister and we realised that we are actually quite nervous about it! I’m going to contact your tour guide, thanks for sharing! Feeling excited now to visit! Hi Marina! Thanks so much for your comment. I’m so glad my post made you more excited to visit Marrakech. It is a beautiful city full of history and culture and I know you will have a great time. If you like to cook I also highly recommend the cooking workshop at La Maison Arabe. You can read my post about it here: http://somethinginherramblings.com/la-maison-arabe-cooking-workshop/. Have an amazing adventure! Hi! You are going to have a great time in Marrakech! Yes, skinny jeans and a loose top is definitely acceptable. You may feel more comfortable if your top covers your shoulders and is high cut. I wore loose pants during my visit, but my friend who was with me wore skinny jeans and felt fine. Happy travels! 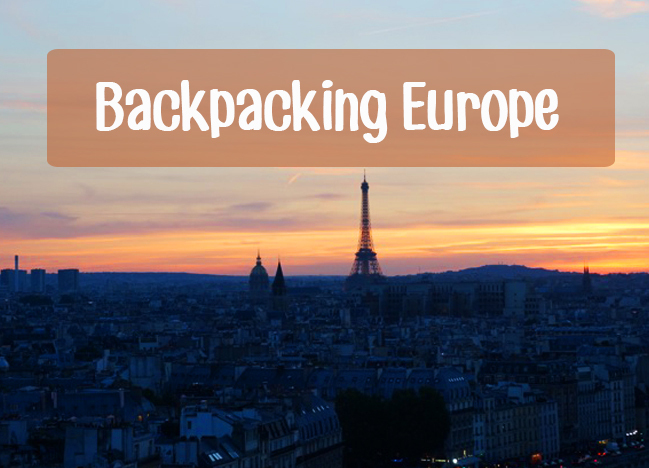 Really pleased to read your tips for travelling. Have always wanted to visit Marrakech and have just booked for four nights in May. Yes, I am a little apprehensive. Think the best idea is to book a guide for our first half day and then take it from there. A little concerned about finding our way ‘home’ through the maze of streets. Curious to see and taste the food! Don’t think we will be too adventurous! Hi Jackie! I hope you have a great trip to Marrakech. I would definitely recommend exploring the city with a guide first so you can get your bearings and feel more comfortable. I took a tour with Mohammed. You can read about my experience on his tour here: http://somethinginherramblings.com/local-marrakech/ . He can be reached at daif996@gmail.com. The food in Morocco is very tasty. I hope you enjoy it! Hi there! A friend and I are planning on traveling to Morocco this upcoming July. Our main concern is where to stay….we are obviously on a budget, but we also want to splurge bit. How are the hotels there ? Expensive or medium-priced? Hi Helen! I’m so happy that you stumbled across my blog. Thanks for leaving a comment. I’m stoked for your trip to Marrakech and hope you have a great time. Enjoy the stunning sunset for me! Hi I am going with my daughter (20) and I am feeling a bit apprehensive. Did you feel safe? did you go out much at night. Thank you. Hi Anita! I am so happy to hear you and your daughter are going to Marrakech.My first 24-hours in Marrakech I felt a bit on-edge, but in hindsight this was only because Morocco is a very different place and it took me a while to sink in. This was not because I felt unsafe. I would recommend going on a guided tour during your first day to help you feel acclimated. At night I didn’t go out too much, but when I did I took taxis. 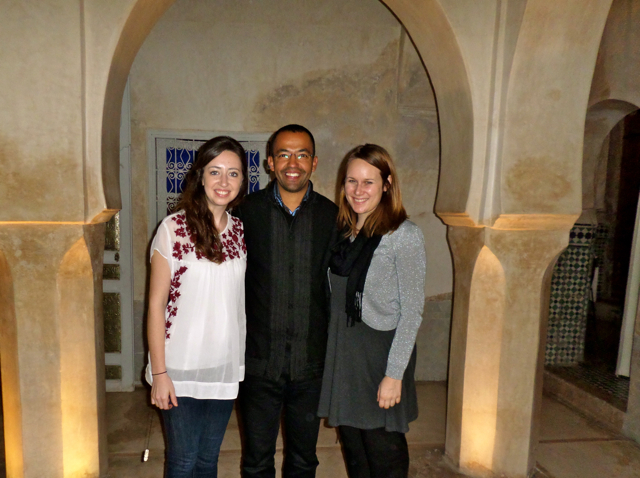 I would also recommend choosing accomodation that is centrally located in the Medina to make getting around easier. Best of luck and hope you have a great trip! 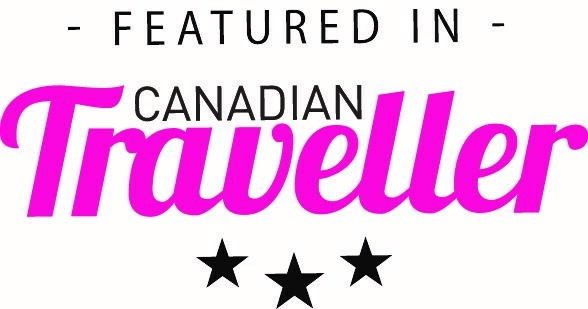 This is a fab blog and I look forward to reading more. I’m thinking of going with my new hubby in June for 2 weeks staying in a hotel complex for R&R with some cultural visits thrown in. Do you think 2 weeks there is ok or will it become too much? Have you any advice on footwear? In places I’ve read sandals but in others it’s said trainers are best? Lots of places have said about watching what you eat, ie no fish, peel fruit etc, eat with hands not cutlery whilst out and about…what advice do you have about food & drinks such as juices? I think we’re going to catch the first couple of days of Ramadam too. Hi Caroline. Thanks for reading my blog and leaving a comment! I think two weeks is a nice amount of time to be in Marrakech if you are looking for some R&R. If you find you want to see more of Morocco while keeping Marrakech as your base, there are some great day trips, including the Ourika Valley (river, villages, waterfalls), Essaouira (beach), and Atlas Mountains. 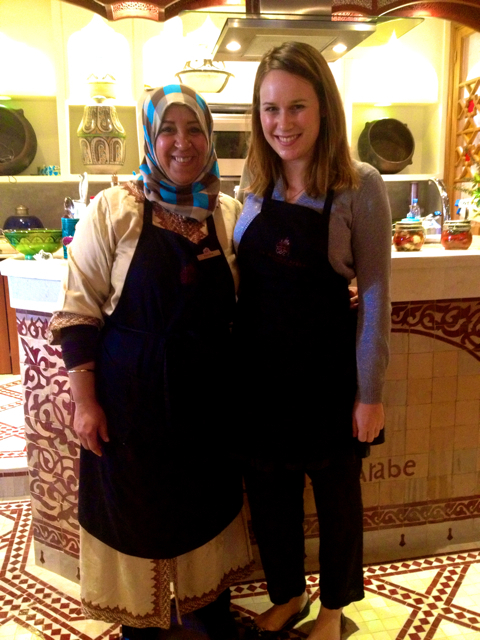 I would also highly recommend spending half a day taking the cooking workshop at La Maison Arabe. It’s hot in Marrakech so you will probably want sandals in addition to trainers if you plan on going hiking. As far as food is concerned, I did not run into any issues, but it is always best to ask your hotel or local guides for recommendations since they will know where the best and safest places to eat are. You help me so much thanx!!! Lenka I am so happy to hear that! Thanks for stopping by to leave a comment. My friend and I will be travelling to Marrakech this summer. 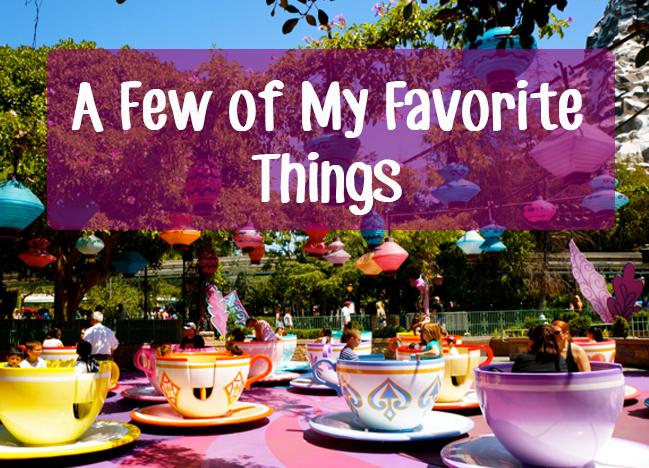 We are having difficulty finding the best (and cheapest!) flight from Marrakech back to the US..essentially new york/DC since we both are from different parts of the US. What are your recomendations? Hi – My friend and I (women – in late 50’s) are thinking of travelling to Marrakech in September this year. Do you think we will be ok? Looking at Club Hotel Riu Tikida Palmeraie to stay – do you think we will enjoy it. Your blog has been really interesting. Can’t decide on where to go for a week. My husband is unable to travel at the moment. Hi Gina! I think Marrakech is a great place to go with your friends in September! A week is a good amount of time. You can take day trips to places like the Ourika Valley and Atlas Mountains. 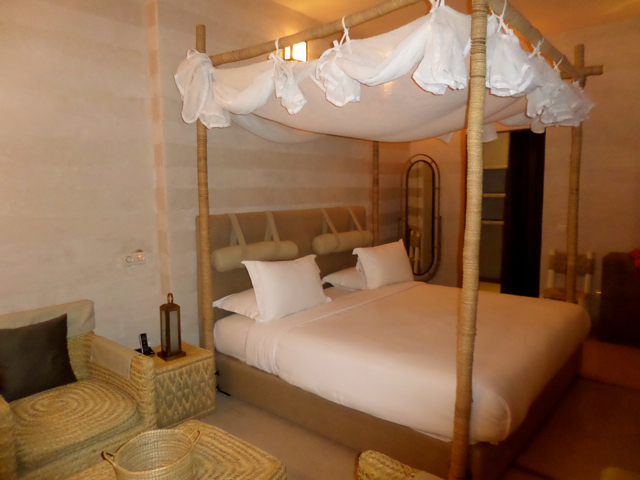 I stayed at Riad AnaYela in the Medina (old city), but Club Hotel Riu Tikida Palmeraie looks lovely as well. Wishing you safe and fun travels! As a solo woman traveler, I had done a great deal of research before making the reservation with Marvelous Morocco Tours, The planning of my trip was made easy by Iddir, and I booked 4 Days 3 Nights Marrakech Desert Tour. Iddir showed me a country of beautiful, varied landscape. He gave me much information about the history, culture, and religion. He provided opportunities for me to visit villages, nomad caves, and interact with local people. Iddir was patient respectful with my many questions and answered all of my emails promptly. He is an excellent driver, knows the roads well, knows exactly where he is going, and always looked after me, concerned for my well-being and comfort. Hi Lauren, I agree with these tips. I also saw women dressed inappropriately – they were simply asking for trouble. I have been to Marrakech twice in the last two years. I was on my guard all the time on my first visit, but when I returned last December I felt completely at ease. Marrakech is safe as long as you exercise common sense and trust your gut instinct. The only ‘danger’ I encountered was crossing the road – although you’ll adapt to it after the first day! Hi Daniela! 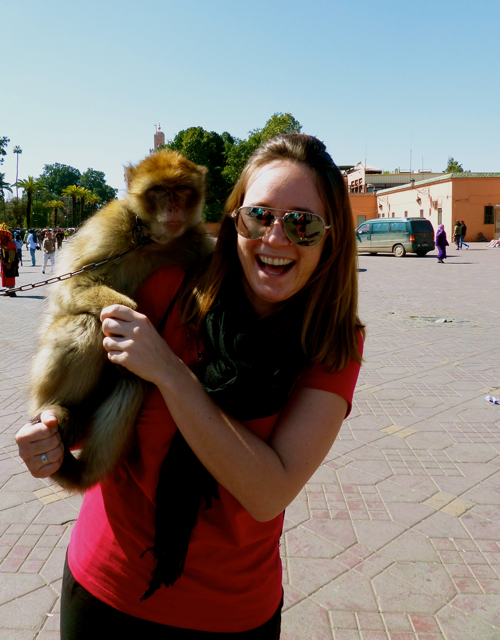 Thanks for sharing your experiences as a female solo traveler in Marrakech! I definitely agree that the destination is safe as long as you exercise common sense. Happy travels! Hi Tina! Thanks for stopping by. I am glad you have found my blog interesting. Marrakech is one of my favorite cities and I wish you a great trip. I would recommend you spend your first day exploring with a guide such as Mohamed, who I mentioned in this article, so that you can get the lay of the land and feel more comfortable in Morocco. I got my cash from the ATM at the airport. US dollars are also accepted at many places and there are ATMs in the city center as well. I hope you have a wonderful first solo holiday! I’m glad you enjoyed this article. Have a great time in Marrakech! Refreshing blog ! My friend and I are going to Marrakech for the first time on Saturday. We plan to be very sensible and culturally sensitive during these difficult times. Extremely excited about the sights, smells and sounds that Marrakech has to offer. Will definitely be contacting Mohammed Diaf for guided tour! Hi Brenda! I’m so stoked for you to head to Marrakech. It’s still one of my favorite places I’ve ever visited. Have a blast and I hope you enjoy your tour with Mohammed! Hi just found your blog, I have always wanted to visit marakech. My husband and I have booked a 4 day break through secret escapes in May for my birthday. My grown up daughter who will not be travelling with us is quite concerned for our safety which is rather unsettling, my husband is quite safety conscious, I have read the gov/travel information today. I am normally unfazed by new adventures, a feel the fear and do it anyway traveller. I am wondering whether this is not such a good idea ? I personally didn’t have any problems with safety in Marrakech. I think it is a great city with many things to do and a place that opens up your world view. I wish you the best of luck on your trip! First- thank you! This is an amazing conversation to find as I plan my first trip to Marrakesh. Second, I will be traveling with my parents for approx 4 nights to the city. I would like to experience as much of the religion as possible, though I am not Muslim. (I will use your guide for the 1st day!) Any tips for ‘things not to miss’? Perhaps your favorite 1 or 2 experiences in the city? Very excited for a ‘Hammam’ day as well! So glad this post helped! That’s great you’ll be visiting one of my favorite cities with your parents. I hope you have a great time! Did you read this post on my top 10 experiences to do in Marrakech: http://somethinginherramblings.com/top-10-things-to-do-in-marrakech/ ? Picking my top 2 favorite experiences, definitely taking a tour with Mohammed and a cooking class at La Mason Arabe. I went hiking in the Atlas Mountains and really loved that as well. Hi Lauren, I really enjoyed reading your comments. I have become a regular visitor to Marrakech since I took part in a tour 4 years ago and I agree that it’s a lovely place and the majority of people are friendly and welcoming. 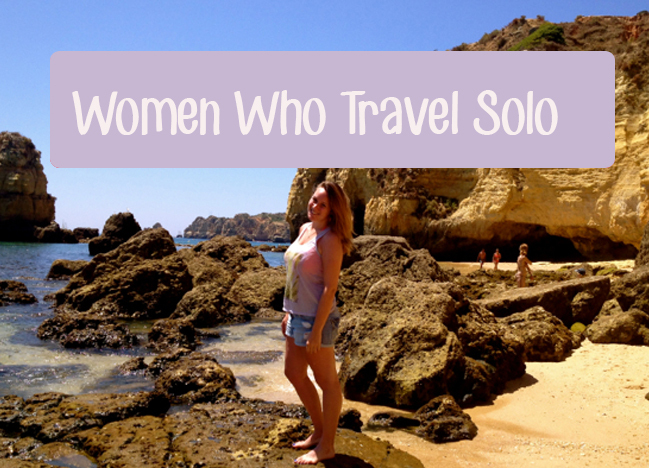 I am a solo lady traveller and like you, feel safe and at home when I am there. I particularly liked your comments at the beginning regarding dress code and it is so true. Strappy tops are a no no, and shorts above the knee are not a good idea either. I just love the place and having found a lovely riad in the medina it’s like going home or visiting friends for me now. I get serious withdrawal symptoms if I don’t have another break booked and am looking forward to returning once again in September. It’s not to everyone’s taste, a bit like marmite, you either love or hate it! Thanks for sharing your thoughts and experiences in Marrakech. I’m glad to hear it is a place that has touched your heart and can definitely relate to the withdrawal symptoms! Have to object however to the picture with the monkey – they are being exploited. We should avoid any attractions involving use of animals including horse and carriages anywhere in the world. Dont support them and they will eventually go away. I agree completely with your point about the monkeys, the conditions they live in are undoubtedly not good, they have teeth removed to stop them biting tourists and are stolen from the wild with their mother being killed. Horrible. We do need to remember though that many Moroccans are very poor and they have to provide for their families. Also the horses and carriages are ok to use as the horses are regularly checked by vets, this is the reason for the yellow band around the legs – the owners are regulated by the authorities and as far as I’m aware there is no problem with using them. The majority of Moroccans are lovely people but their life is so different to ours. I absolutely love Marrakech and am looking forward to returning in four weeks for a short break. Thank you for your comment. I just love Marrakech and look forward every year to returning at Christmas. Hi! I’m flying out with my sister tomorrow morning We had booked 4 tickets with a male cousin but they both have had to cancel at the last minute! Leaving my sister and I to travel alone, we’ve been hearing really bad stories and being warned but thank you your blog post has slightly calmed me down! Although I guess I’ll only relax once we reach there and I can see it for myself. But your tips are very practical and helpful! I wish you a wonderful trip! Enjoy the beauty of Marrakech. Have a wonderful time, be sensible but pleasant and you won’t have any problems. Don’t let anyone approach you to show the way anywhere be firm smile and say NO. I’m going again in 2 weeks and counting the days. I would be interested to know how you get on. Another tip is that before I eat anywhere I use the toilets to see where they are situated, if behind a door off the kitchen I ask for a mint tea and leave – you don’t want to chance upset stomachs! Have a great time keep an open mind and enjoy. hanks for sharing your extra tips. Hope you have a wonderful time in Marrakech! Thank you for writing this, and I’m so glad I found your post! I’m traveling to Agadir for work this winter, but would so love to take a short detour (1-2 days) to Marrakech. I’d do that part alone, and family members are worried and even discouraging me a little. Thank you doubly for sharing Mohamed’s contact info and where you stayed… a huge help! I didn’t know where to begin to look or plan, and your post was reassuring as far as safety. So glad to hear this post help. Have a great time in Marrakech and definitely don’t let traveling alone stop you from visiting. Thank you Ibzy. Marrakech is a beautiful place! My wife and I are coming to Marrakech on the 31st Dec -5 Jan. My wife usually wears sports tights or leggings, is this suitable or should she cover up a bit more? Hi David! I’d recommend baggier pants than tights or leggings. However, I am sure if she wore tights or leggings she would not encounter problems, this is just what I personally felt most comfortable in. Have a great trip! Leggings will be fine I always wear them. Don’t worry too much but it is best to avoid very low cut tops. I went in September it was very hot and I wore cropped cotton trousers or leggings with tshirts. Have a great time, I’m envious! I’m going to Morocco for the first time next week and this post has made me feel much more prepared! My boyfriend is very worried about us being dressed inappropriately and standing out in our normal (conservative) clothes but I’ll show him this to put his mind at ease! Hi Bekki! Glad to hear my words could provide some reassurance. Have a great trip! I left a comment 2 months ago expressing my appreciation for this post, and I wanted to follow up after my trip to Marrakech. I’m so glad I didn’t let worried friends and family discourage me from going! First, a million thanks for the introduction to Mohammed! He was fantastic, I loved everything that he showed me, I felt safe with him, and he helped me talk down the price on some gorgeous scarves. 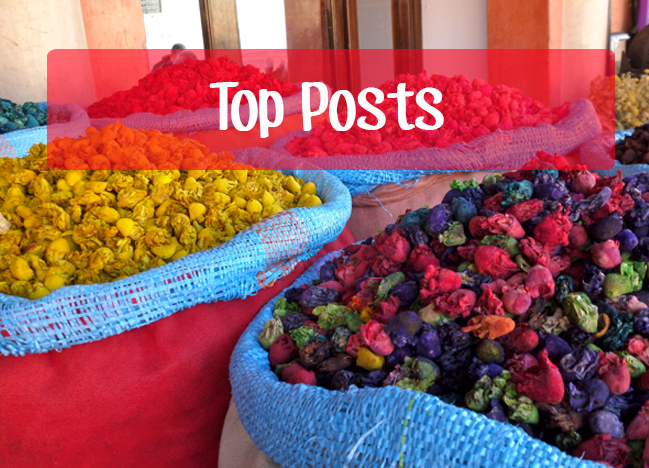 Great advice in this post, and Marrakech is like another world. I did feel like sellers in the souk harass you enough to drive you crazy, but a curt “no” or no response puts an end to that. And there are sellers and others in the city who are perfectly lovely people I was happy to meet and chat with. I wasn’t prepared for all the mopeds zipping about, and often threw myself against the wall of an alley just in time. I felt guarded but relatively safe the whole time, though I almost got taken in by 2 teenage boys who told me the road back to my riad was closed and to follow them because they knew the way. Nice try, boys. Thanks for adding in your tips – these are really helpful! I’m so glad to hear you enjoyed your visit to Marrakech. I noticed this was published a couple years ago…given our current political climate do you feel Marrakech is still a safe city to visit? I’d be with my husband & perhaps 15 year old nephew. Hi Lisa! I haven’t been back recently, so I can’t speak to this matter fully, however on my visit I didn’t experience any negative reactions to U.S. politics. My friend Mohammed lives in the city and would have a better perspective on the current day climate. You can reach him at daif996@gmail.com to get his insight. Lisa have no fear at all it is all quite safe, if very busy, some times smelly, exciting, colourful fascinating and stimulating. The Isalamic decorative architecture is quite stunning. Do not miss a trip here, but relaxing it is not! Stay in the Medina in a Riad if you are a confident or easygoing traveller, the Riads are a haven of calm and very clean, comfortable, friendly with good breakfasts, evening food, good advice and support etc etc. Best pick a Riad reasonably close to the centre, but prices get lower as you go outwards from the centre so it is a compromise. After a day with your guide you will most likely feel confident to walk pretty well anywhere in the main part of the city where the attractions are, with the help of you phone. Otherwise if you are particularly nervous travellers or if you feel you must have a modern western style hotel, stay outside the Medina and taxi in, but my opinion is you will miss out on the real atmosphere. For the first day or morning best to take a guide for the city to get your bearings and get used to the atmosphere. We found a smartphone mapping app like MAPS.ME really useful for getting aroun, but download the map first to your phone or it will cost the earth in data if you are using a live map all day If you have time please do take a trip to the Atlas Mountains, Imlil is an easy trip with a guide and a combined driver/guide. 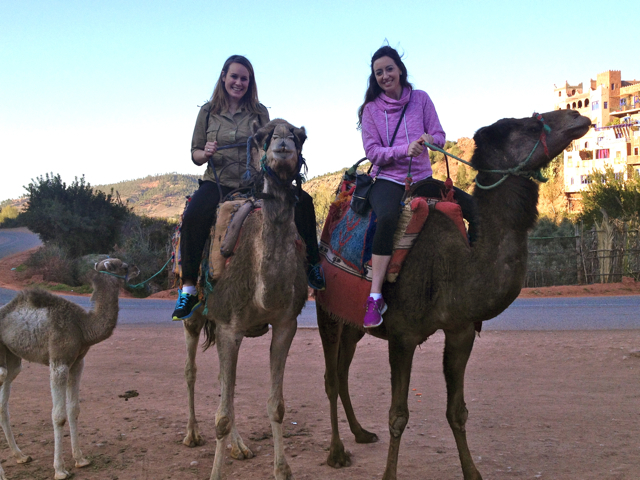 We found five nights in Marrakech was enough to see most of it, including a full day trip into the mountains. Have fun! Lisa just to add that my wife and I went to Marrakech on the 31st Dec 2016 so info I just posted is current. There are tourist police in Marrakech who work in the background to prevent undue harrassment of tourists and to take any complaints. You will get endless offers from youths to guide you to the attractions for a tip, but just get used to ignoring them, find your own way around and they will give up and leave you alone! does he work for a tour company? does he has a website? thanks for all your good tips, hope to hear from you soon. If you are interested in contacting him for a tour his email is daif996@gmail.com. We booked Mohamed by searching the internet and came across your blog. He truly is fantastic. 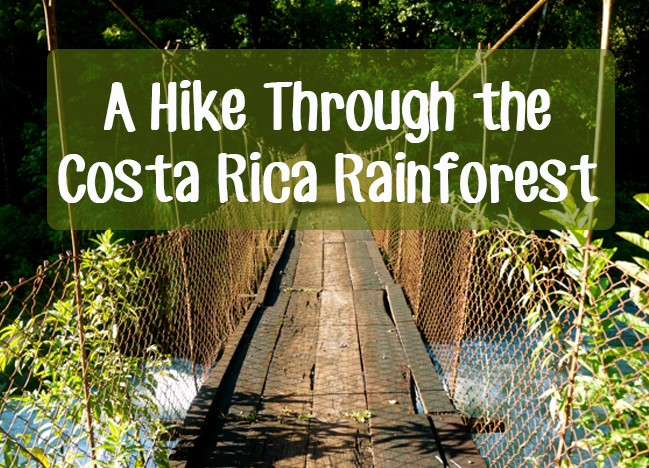 By far one of the best guides we have used in all of our travel. Thanks so much for all the info and pointing us in Mohamed’s direction. He has kept in touch with us throughout our trip and we would refer him to anyone that comes to Marrakech and wants to enter the souks!! its a maze in there for sure! If any one wants the best guide in Marrakech give this guy an email. daif996@gmail.com you wont be disapointed. I am going to morocco with my mom and she is very worried about the ‘dress code’. I suppose a dress just above the knee with no bare shoulders should be fine? Hi Linda! Yes I do think a dress above the knee with no bare shoulders will be perfectly fine. I’d also bring a light jacket and scarf along just in case you feel more comfortable that way. Have a blast! I and my friend had been to Marrakech a number of times. To be honest, I felt a bit uncomfortable when I am along. No special reasons but for the place to be unknown. 😮 Having said that, Marrakech is a fantastic city and locals are quite used to seeing unescorted females. 😳 I’ve heard eve-teasing seems to be quite rampant in smaller Moroccan cities and countryside. If you’re visiting Marrakech, be on your safer side and put on clothes that don’t flash too much skin – you will be fine. To follow up what you said is right, Marrakech is quite a touristy place. I’m going to Marrakech with 2 friends (girls) and I’m worried about returning to the Riad after the sunset. Its not as central as I would like, but its in the medina area. What would you sugest? Grab a taxi? Or its ok to walk? I’m always “afraid” of taxi drivers in countries like this… Did you feel unconfortable with them? Thank you for sharing this things with us. I’m so happy to hear you are going to Marrakech and hope you have a great time. I would recommend taking a taxi back to the Riad after sunset. Just ask your taxi driver to negotiate a price before you get in the taxi to avoid getting ripped off. Hi. Your stories are awesome and inspiring! I would love to travel to Morocco but I have been hesitant to go alone or even with another friend. In which countries have you taught English? Go for it! The world is waiting. I taught in Spain and Costa Rica.